This room is still a work in progress, which is why I haven't shown it in a renovation reveal yet. The new couch is a navy blue, and when we brought it in, I realized that the throw pillows that I purchased about three years ago looked great with the couch. And after I took the picture, I saw the Fiestaware canisters in the background, on the kitchen counter - I've had these for a couple of years now. They are in the same shades of blue and green that are in the throw pillows, which I never noticed before. I had to laugh, because the house decor is coming together like I planned it, which I didn't. But I guess if you buy what you like, it all ends up working. Blues and whites - it's like we meant to do this! The only time I try to make colors go together is when I'm buying clothes; this house stuff was interesting to me mostly because I wasn't trying to make it happen. I tend to be more of an "oooh, that's pretty" shopper than someone with a plan, but apparently it works in the end. Ahhhhh. Tall trees. Blue skies. It was so nice. So now I'm curious - do you plan your color schemes with your home decor, or does it just magically fall into place? Let me know in the comments, and tell me what your predominant colors are. 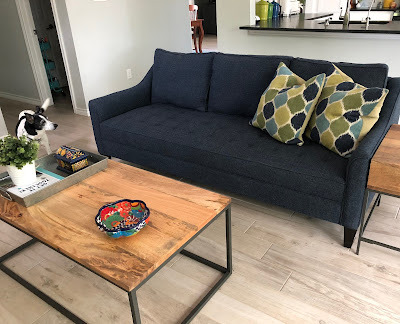 It's funny, we were looking to get a lighter gray couch because of Paco's fur, but when we brought fabric samples home, they looked washed out with our flooring and wall color, so I just decided that I'd be vacuuming the darker couches more often...oh well. When I was first living on my own, I was obsessed with the idea of a red kitchen, largely because my ex-roommate left me these cute red curtains from Ikea. I still have some red serving dishes and textiles, but have added more colors in. That's the only time I was ever really intentional with decor. Otherwise, like you said, things seem to fall into place if you buy what you want, especially when I started mixing my tastes with Terry's. Those chairs are under $20 at the big box stores! We found a couch that Sam liked for his patio but it was "on clearance" for $398, which wasn't much of a clearance from the original $450 price tag, so he didn't get it. I wonder if it'll still be around and get marked down even more soon...patio furniture is really expensive (for something that is going to get weather-beaten). I think a red kitchen is so fun, but I couldn't resist the siren song of Fiestaware in ALL THE COLORS so my dishes are a rainbow. I always seem to go with shades of blue and grey, or if I do what Mr. Helen likes it's browns and beiges. And it literally can be any shade in those colors. We have a living room and a family room so one is done in blue/grey and the other in brown/beige neutrals. I love your navy - and that's what I have in my bedroom. Honestly though, I've often wondered if I were alone if I might not accessorize with some hot pink, which is probably my favorite color and I think would look really good with my grey sofas. I could not do browns and beiges. I need more color! That's good of you to give Mr. Helen one room in his color preferences. I do love shades of gray (see my walls for evidence, LOL) and so many colors play off of it nicely. I have a tiny bit of pink accents in my laundry room and it's really pretty. I love how your things are just naturally coming together. I'm having fun putting our new home together. I started out with a plan and so far it's working. A lot of red is showing up even though I didn't realize that I liked it so much. Photos of the house coming as soon as I get a few more things together. In the mean time.... I'm loving the deck. See, that's interesting - you have a plan and yet you're noticing a certain color that keeps showing up! Love it; can't wait to see your new house pictures! Interesting - I'd love to see some pictures of the yellows and greens together. I am using yellow a lot in one of the hall bathrooms, but it's coupled with, you guessed it, blue. If it makes you feel any better, I was REALLY flummoxed by choosing an area rug for the living room. Jeff pointed out that when we watch Fixer Upper, even Joanna will bring tons of items for decorating and then change her mind when it doesn't look right, so that made me feel better about not having to get it right the first time. I bet if you just started with something that you really liked, you would feel more comfortable with decorating. That's a good idea...maybe I'll start with some throw pillows! Blue used to be my favorite color and I still like it, but pink is my favorite color now. I do have some pinkish chairs in my living room. When I re-do it, I'm pretty sure it'll still be pink! I love your new couch, and I really love the coffee table and side table!! Just noticed Paco eyeing the couch. He's saying "she put dose pillows up dere just for me :)"
You are so right about Paco's thoughts, and I was looking for more throw pillows last week - found a couple, but they were a little pricey and I thought, nope, I would be so mad when I saw Paco scrunching them up with his paws to make the perfect spot to lay on. Ahh, pets. Not much of a plan - neutrals with pops of purple. Ooo, I love that screened in porch. Paco!!!!!! Ahhh, purple. I love it. For several years the wall where our fireplace is was painted deep purple and it was so pretty - really made that huge fork painting pop. I think I'd have more coordinated color palettes if I were a more patient shopper and had a bit bigger budget. Too often I want something RIGHT NOW, and will get whatever is on sale and just make it work. Luckily for me, DH is a bit color blind, so he doesn't really notice or care. The only exception is my main bathroom. For some reason, maybe because it's a smaller space, I enjoy coordinating colors in there. It was pink with white and brown accents for a number of years (like those Brach's Neapolitan coconut candies, yum! ), then brown with white, and now it's a light teal with darker teal and champagne accents. 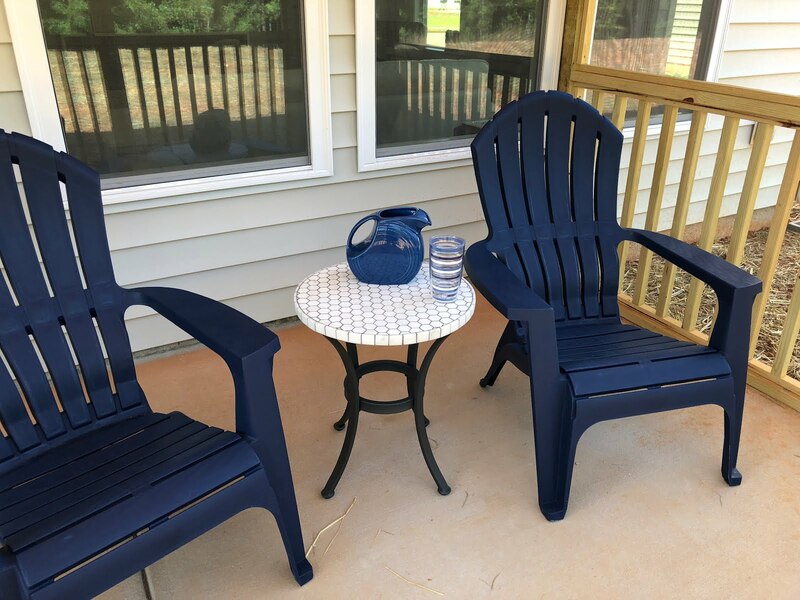 I love seeing how your colors match up even though the pieces were purchased randomly and years apart - you do have a good eye! I have found that I buy a fresh org or something because the ‘color is awesome’ only to get hone and find that I already have one (or more) in the same color in my drawer!!!! I buy what I like and it works!!! Like you said, if you buy what you like then it falls into place. My style is fairly eclectic and I like color pops. So, you will find those all over the house. When we were working on our house, the paint colors were the hardest thing as that kind is where I base my decor from. 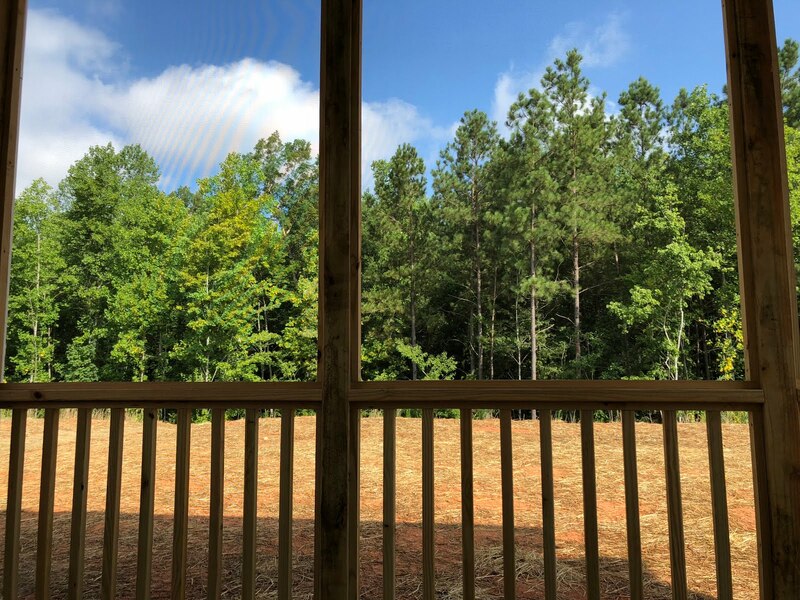 Ooo, that screened in porch sounds fab!!! You are so good with color! I am not surprised it falls in to place with you. Our old decor was earth tones which I am so over, and we want to go more modern, but we still have so much warm stuff, it will be years before we can (afford it all and redo some stained floors etc. )!